Enchanting tablas, a pump organ (harmonium) and infectious voices filled Maestro Technologies’ grand lobby at 1 West State Street on Saturday, November 3rd. 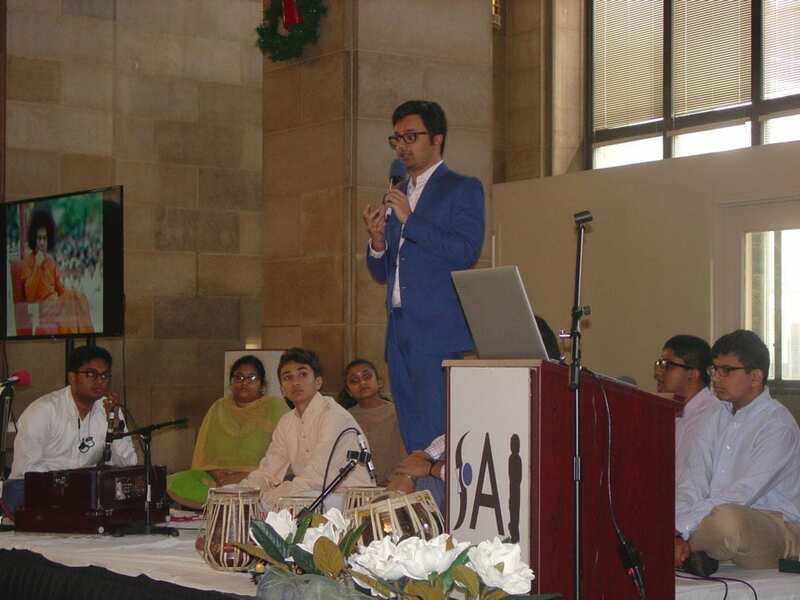 Following a calming spiritual invocation to purify the space as well as the hearts and minds of the people in attendance, Dr. Pallav Kumar Baruah, Head of Mathematics and Computer Science at India’s Sri Sathya Sai Institute of Higher Learning (SSSIHL) discussed an important collaboration with Maestro. He presented to the gathering an account of Sri Sathya Sai System of Integral Education practiced at the university. Sri Sathya Sai Institute of Higher Learning was founded to inculcate ethical and moral values in students. These ethics and morals form the undercurrent of every program taught at the university. “The development of a student’s character is just as important as imparting knowledge,” said Dr. Baruah. Most students typically spend between two to five years pursuing an education at the institution. As a result, what differentiates them from graduates of other universities is the transformation of their hearts, not just the training of their minds. Founded by Bhagawan Sri Sathya Sai Baba, who had established the Mission on Education for Human Transformation, the University hosts over 1350 undergraduate, postgraduate and professional program students across four campuses. Admission is entirely merit-based and open for all, irrespective of income, religion or region. With an amazing student to teacher ratio of 9 to 1, the institution provides free education to students for all programs of study including waiver of all fees, tuition, examinations, laboratory, library, computers, sports and medical. “Education must teach a person what life is, and what its goals are. It must purify the heart and clarify the vision. It must prevent pollution of the hand, heart and head by habits injurious to the individual, society and the nation. It must promote virtues and raise the moral and spiritual standards of the educated,” says Bhagawan Sri Sathya Sai Baba. Ultimately, through this partnership, Maestro hopes to recreate a similar model of education and training in Trenton.